EAR Professional Audio Video > Products > Newtek TriCaster Specials EXPIRE SOON! Newtek TriCaster Specials EXPIRE SOON! In each one-hour session, we’ll step you through the power and functionality of software driven production. A NewTek product expert will demonstrate the systems live, address system capabilities specific to your needs, and answer any questions. Schedule a demo by proposing the date and time most convenient for you (Monday-Friday, 9am-3pm MST). You will receive a follow-up email with details that you may add to your calendar. Right now with this Special Introductory Offer, get increased trade-in values on your existing TriCaster towards the purchase of the new TriCaster TC1. 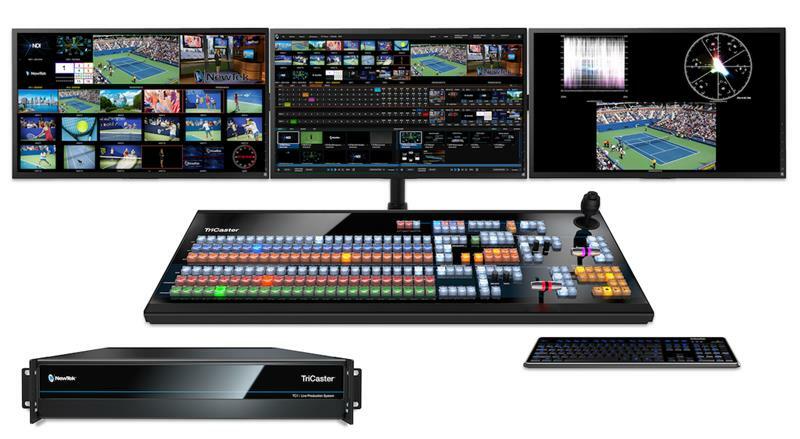 TriCaster TC1 is the one you’ve been waiting for, with 4K UHD, 60P, 3G, 16 external inputs, IP capabilities, and built-in Skype TX. Complete production, like never before. Hurry – don’t miss this opportunity to future-proof your productions while getting more for your trade-in. Watch our short webinar for details. Trade-up Credit Also Available on TC1 Bundles! Call your EAR TriCaster product specialist to place your order 800-473-6914 or to request a price quote.